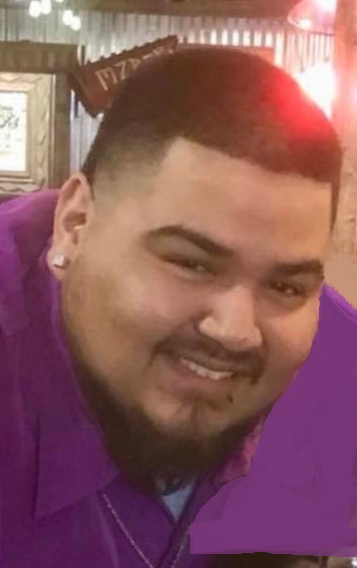 Sinton – Jaime Amado Perez “JP3”, beloved son, grandson, brother, nephew and uncle, passed away on April 1, 2019. He was the youngest son of Monica H. Garcia and Jose G. Perez. Jaime was our teddy bear. He gave the best hugs and when he smiled it lit up the room. He was born and raised in Sinton and graduated from Sinton High School. He was a pipefitter by trade and a loyal friend at heart. He enjoyed playing video games, watching movies and spending time with his family, his girlfriend and her family. He will be remembered by many for his easy going spirit and his big heart. Jaime left us way too soon on April 1, 2019 at the young age of 26. He will live forever in our hearts and souls. We are grateful to God for letting us have this beautiful heart and soul in our lives from the day he was born on October 6, 1992 until he departed for his eternal home. Though our time with him was cut short in this lifetime, the memories, the smiles, the laughter and the love we shared with him will have to hold us up until we meet again one day soon. Until then, Jaime we will miss you and keep loving you every day until death comes for us to reunite us with you. He is preceded in death by his sister, Lisa Perez, and his paternal grandmother, Cruz Davila Perez. He is survived by his parents: Monica H. Garcia (Jose David) and Jose G. Perez (Lisa); sister, Gabriella Marie Benton (Jordan);brother, Jose Julian Perez (Gabriela); maternal grandparents, Mary Lou Herrera (David Rivera) and Valentin Herrera (Irma); paternal grandfather, Jose “La Rana” Perez; 3 uncles, an aunt, nephews, nieces, cousins and his girlfriend, Gabrielle Marie Villarreal. Visitation will be held Friday, April 5, 2019, 1:00 PM at Resthaven Funeral Home Chapel, Sinton with a rosary at 7:00 PM. The Funeral Mass will be celebrated at Sacred Heart Catholic Church on Saturday, April 6, 2019, 11:00 AM. Burial will follow in John J. Welder Memorial Cemetery in St. Paul, Texas.